The recently introduced Bloomberg Market Concepts course provides an introductory guide to Finance. For those educational institutions that have Bloomberg Professional, this is free to students when they complete the course at a Bloomberg terminal, which would otherwise be charged for, when taken online. Bloomberg terminals are available within the The University of Manchester Library service and therefore BMC is free for University of Manchester students (and staff) here. To begin, a BMC account has to be created. This is achieved by entering the function code BMC on the command line, at the top left of the screen, pressing the ‘Enter/Go’ key and then selecting ‘Sign Up’. BMC function page with ‘Sign Up’ option highlighted. BMC covers 4 modules: Economic Indicators, Currencies, Fixed Income and Equities. These are also divided into sub-modules. For example, ‘Primacy of GDP’ is within the Economic Indicators module. BMC home page (when logged in). 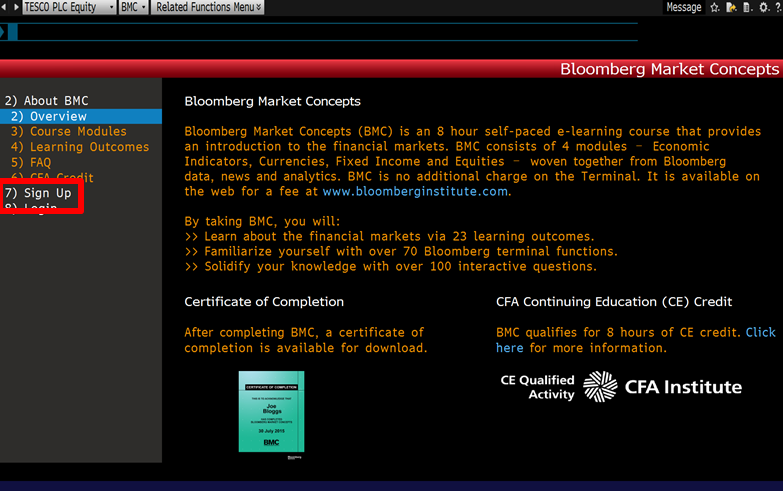 The course is self-paced and typically takes around 8 to 10 hours of individual study at a Bloomberg terminal. Minimum progress at one sitting is an individual sub-module. Modules have varying content, so will not have uniform completion times. Within each module there are assessment questions which have to be competed before progressing further and also before moving on to the next module. 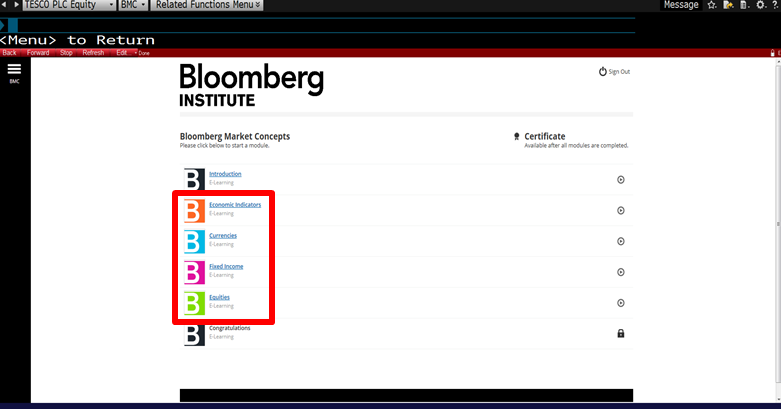 In completing the course, students gain a wider familiarity with Bloomberg, covering over 70 functions. This represents an opportunity to improve technical knowledge and experience using a leading financial service, thus boosting their employability. 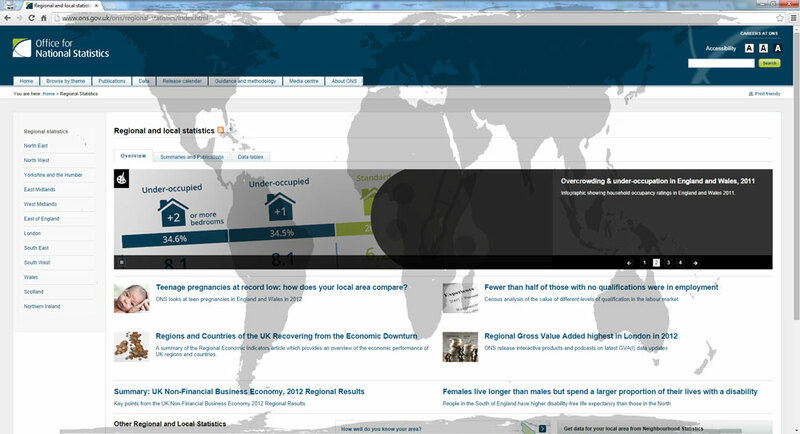 This improved competence benefits research performance in locating data and business news content to complete assignments. Unlike Bloomberg Essentials Training Program (commonly known as ‘Bloomberg Certification’) where there are examinations with a specific pass mark, BMC doesn’t have this. Percentage scores for modules and for the course overall are included on a student’s BMC account (valid for 12 months) but not on the certificate, which displays name and date of completion. On completing all modules, click on the ‘Certificate’ option from the BMC home page to obtain a PDF copy to print and/or save. BMC home page with ‘Certificate’ option highlighted (when logged in). Within the BMC function screen (not logged in), there is an FAQ link on the left hand menu. It is also possible to visit the Bloomberg Institute web site. 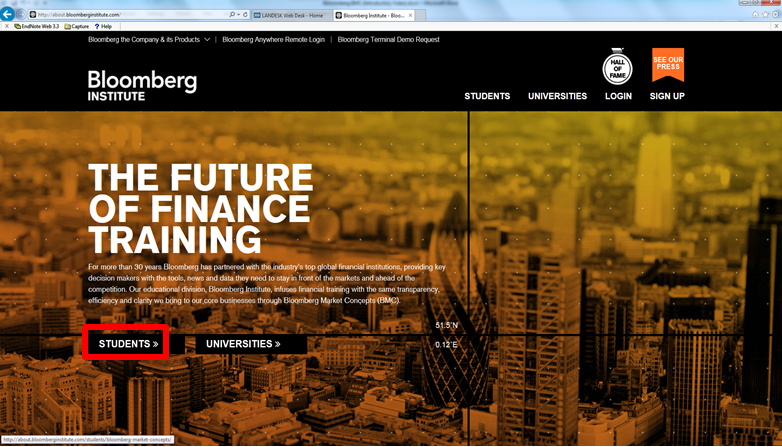 Bloomberg Institute web site – for further details on Bloomberg Market Concepts. Bloomberg Professional is a financial data and news service available to current students and staff of The University of Manchester. Training and support is provided by the Business Data Service, part of the Research Services Division within The University of Manchester Library service. FRED Federal Reserve Economic Data for US exchange rates. Historical Exchange Rates and Currency Converter from OANDA. Search Global Financial Database It has daily and monthly exchange rates for many different countries, in some cases going back hundreds of years. Economic databases also provide exchange rate date: UK Data Service (formerly Economic and Social Data Service) provides IMF monthly, quarterly and annual data. The oil price is often in the financial news as a key economic indicator so it is not surprising that many researchers are interested in historical oil price data. The screenshot below shows a oil price chart for “Brent Crude Oil Spot Price, Sullomn Voe, Scotland” from Quandl’s crude oil prices. 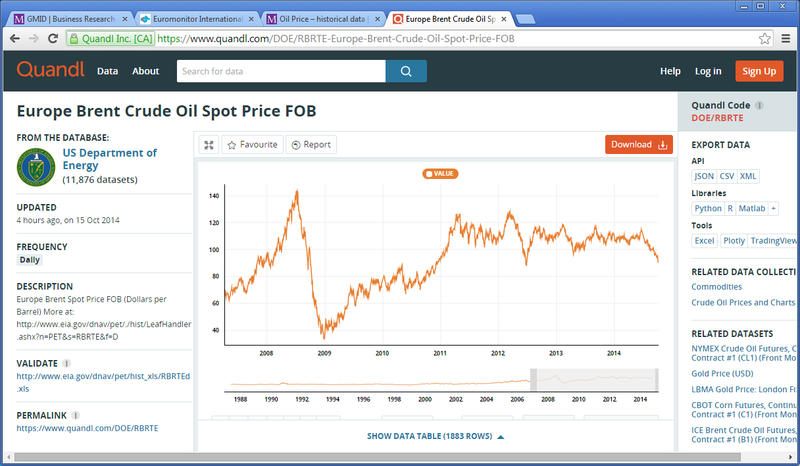 Datastream from Thomson Reuters includes numerous historical time series of oil prices among its commodity category. Benchmarks from Thomson Reuters include Brent (OILBRDT) and WTI (OILWTIN) crude oil. Global Financial Database (GFD) also have these benchmark oil prices. 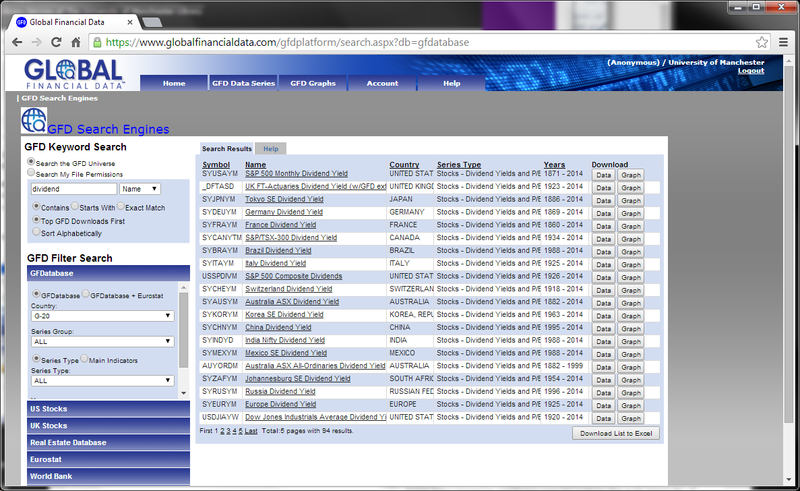 (GFD) has historical prices for Brent and WTI crude oil (select GFDatabase and series type Commodity Prices). GFD has data for Brent going back to 1957 and WTI going back to 1860. 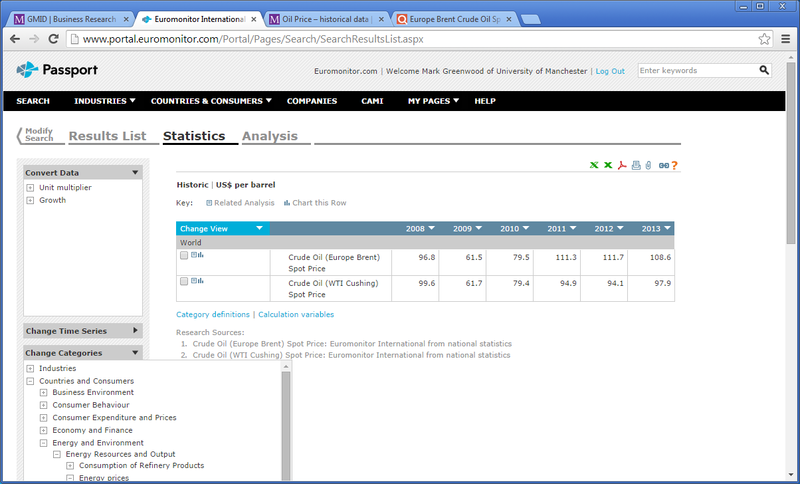 Passport (formerly GMID) from Euromonitor also has crude oil prices for Brent and WTI Cushing. However, these are only annual prices – if you want monthly or daily prices then the databases above are better. In many circumstances it is acceptable to use any of these sources for historical crude oil prices but your text or references should make your choice clear. If you are getting other research data from Bloomberg or Datastream it makes sense to get your oil prices from the same source. The previous oil price post (January 2011) included this oil price chart showing that Brent and WTI have been almost identical. On closer inspection the two series chosen are from different sources: OILBRNP (Brent) is from ICIS Pricing while OILWTIN (WTI) is from Thomson Reuters themselves. Governments and authority bodies around the world collect population and economic data and make it available for the public online. Here is a compilation of some of those websites, most of which have an English language option. If you find one for a country that is not in the list below, please suggest it in the comments. Edit: Updated again 15 December 2014; there are now fewer steps so it has become easier again. It can be difficult to log into IHS Global Insight (formerly just Global Insight) for some institutions, and then to find the country risk ratings is hard too. 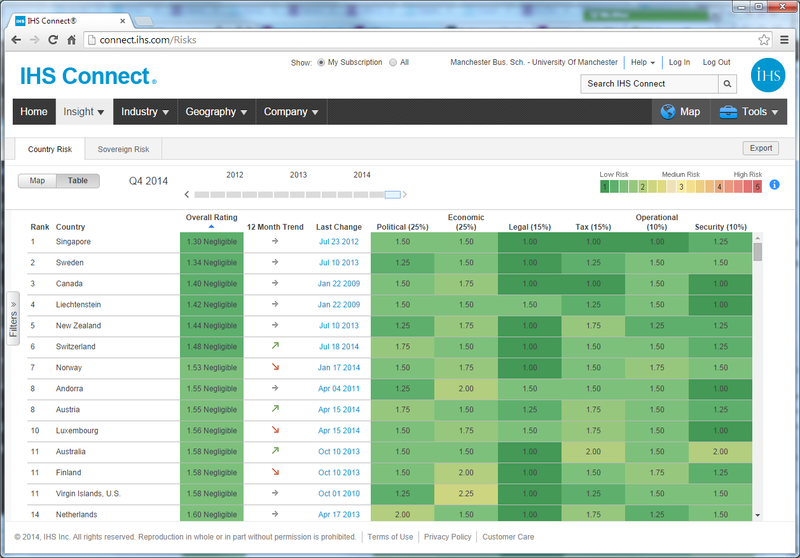 Risks and Ratings has now been moved out of IHS Global Insight to IHS Connect, another part of their website. For staff and students at The University of Manchester, these steps should offer some assistance. Visit the Library’s Database A-Z page for IHS Global Insight: and click on the link to launch it. Click on the ‘IHS Customer Login’ menu, click on IHS Connect. You are now on the ‘IHS Connect’ website. On the main menu bar, hover on ‘Insight’ then click ‘Risks and Ratings’ then ‘Country Risk’. You should then see a screen like the following. The tool is very easy to use, allowing you to sort the columns and change the time period. Just select the linked name or a download button to get the page for downloading data. Analysis of long-term data is a main market for GFD as illustrated in their White Papers, Global History of Currencies and GFD blog. GFD does not (with the University of Manchester subscription) provide data on individual stocks, but it does provide a wide range of series covering bond and equity market indices, commodity prices, exchange rates, interest rates and macro economic series. Thanks to the research student, looking for historical UK dividend yield, who mentioned that a paper had got data for UK aggregate stock market from “Global Financial Data”. This is essentially an edit and re-post of Global Financial Database (posted June 2011) following a check that the GFD interface had not changed significantly in the last 3 years, and that the UK aggregate dividend yield was part of the University of Manchester subscription. Thomson Reuters Datastream is possibly the largest database in terms of the numerical, historical data available. However, it can sometimes surprise with data not being available. Recently this has been highlighted with research students looking for dividend yield data for several international indices. Equity indices are provided by a number of different companies and this means that the datatypes available in Datastream can vary from index to index. In addition, when Datastream says that it has 35 years of data for an index, this is for the index level (datatype Price Index – PI), and other datatypes may well have less historical data. There is a quick way to check datatype availability using the Datastream Navigator. Find and select the “more” at the end of the Headline coverage and you get a window displaying datatypes and dates. 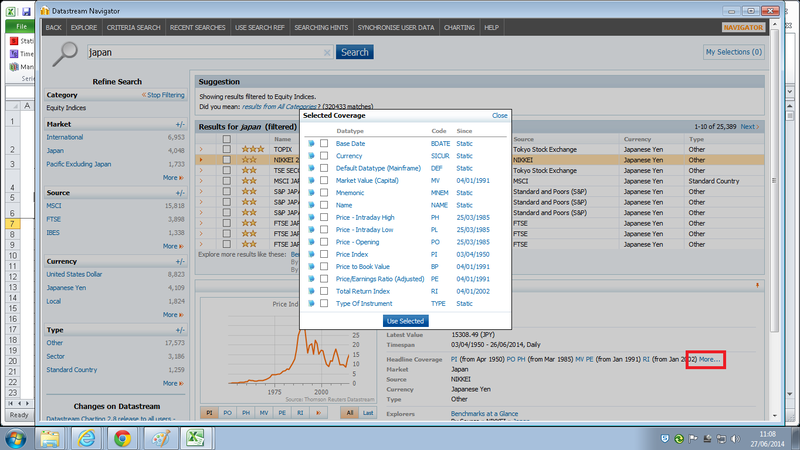 The following screenshot is for the Nikkei 225 (JAPDOWA) – it shows Price Index (PI) available from April 1950, Total Return Index (RI) from January 2002, and Dividend Yield (DY) is not available at all. If the datatype that you want is not available, or does not have sufficient historic data, there are two options. Second, choose a different index where DY, or MSDY or DSDY, is available. For Japan the MSCI Country Index MSJPANL has MSDY available from December 1969, and Japan Datastream-Market TOTMKJP had DY available from January 1973. Although this post has been about equity indices, this approach works for finding the historic availability of datatypes for other Datastream series, for example the commodity crude oil series OILBREN.